Navratri Puja Vidhi - Simple Nine Day Puja – How to do Navratri Puja in North India Hindi Method with Ghatasthapana? Navratri Puja Vidhi in North India include Ghatasthapana, Kumari Puja etc. 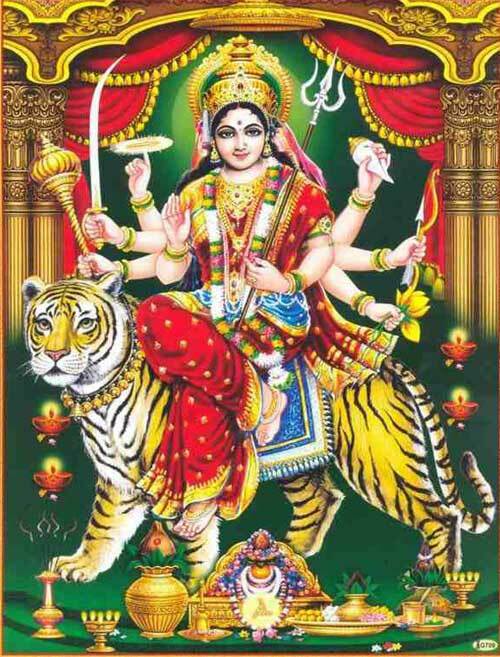 Here is a simple method to do nine-day Navratri and Durga Puja in North India. It is based on the procedure followed in Maharashtra, Uttar Pradesh, Gujarat, Madhya Pradesh, Rajasthan, Haryana, Jharkhand, Chattisgarh, Punjab, Bihar, Jammu and Kashmir, Uttarakhand and Himachal Pradesh. When arranging and preparing for puja keep chanting this mantra - "ऊँ ऐं ह्रीं क्लीं चामुण्डाय विच्चे"
First take bath and wear red color dress in the morning. Take the open mouth clay pot and fill soil up to half of the pot. Then put the barley and wheat seeds. Put soil on top of the barley and wheat seeds. Again put barley seeds but do not put on center of the pot. Again put soil. The barely pot is now ready. This should be placed atop a eight-petalled lotus drawn using mud or kumkum. Tie sacred thread on the Kalash Pot. Wrap the coconut with a red cloth and place it on top of kalash. Prepare the puja tali by placing garland, lamp, dhoop stick, fruit, sweet and scent. Light the lamp and circle it around the kalash. Light dhoop stick and circle it around kalash. Place a flower garland on the kalash. Offer scent to deity by sprinkling it on the kalash. Put a red cloth on a raised platform or stool. Put the cloth (red chunari) on the Goddess Durga Painting and place it on the raised platform. Offer prayers to Goddess Durga. Ask her to reside and bless the home for nine days. Circle lamp around the painting of Goddess durga. Next put garland on Goddess Durga painting or photo. Sprinkle water on the barely pot daily for nine days. Puja should be performed on all nine days. (Panchopachar Puja). You can sit and pray in front of the kalash and painting of Goddess Durga for nine days. You can read stories of Goddess Durga and also listen to prayers during morning and evening. Fresh sweet and fruits should be offered on all nine days. Apart from this make it a point to read Durga Saptashati on all days. On the tenth day morning you can distribute the barely shoots – the grown barley. The coconut can be used to make sweet on the tenth day. The water should be offered to a plant. The rice used can be donated or used to make sweet.